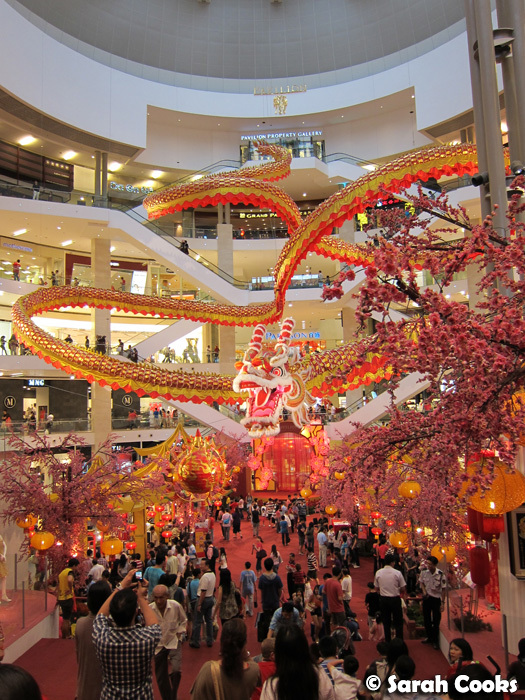 A dragon in a shopping mall? Can't get more Chinese than that! 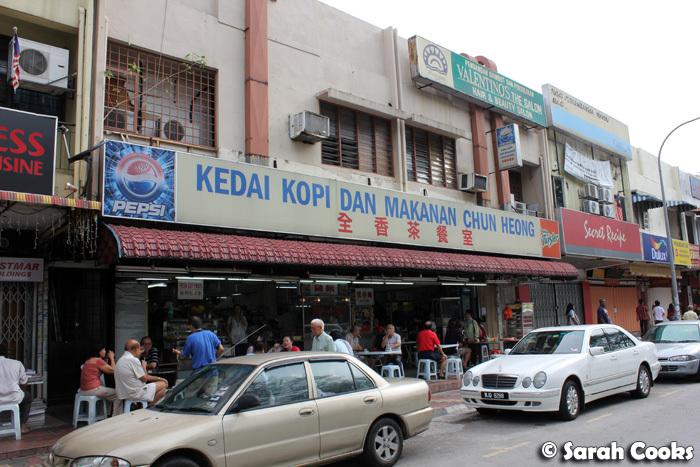 For my final post on Kuala Lumpur, we're taking a Chinese focus. 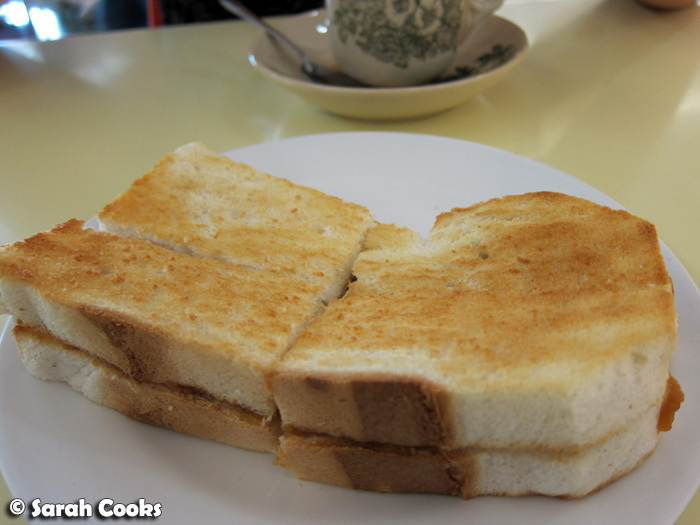 As I mentioned in my last post, we had heaps of kaya toast in KL. 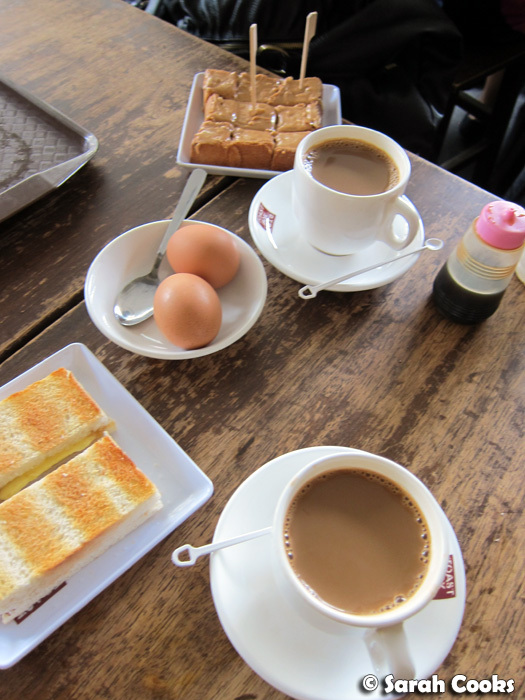 Traditionally a casual roadside breakfast, many chains have now popped up serving up roti bakar (literally "toasted bread"), kaya toast, soft-boiled eggs and other kopitiam favourites. 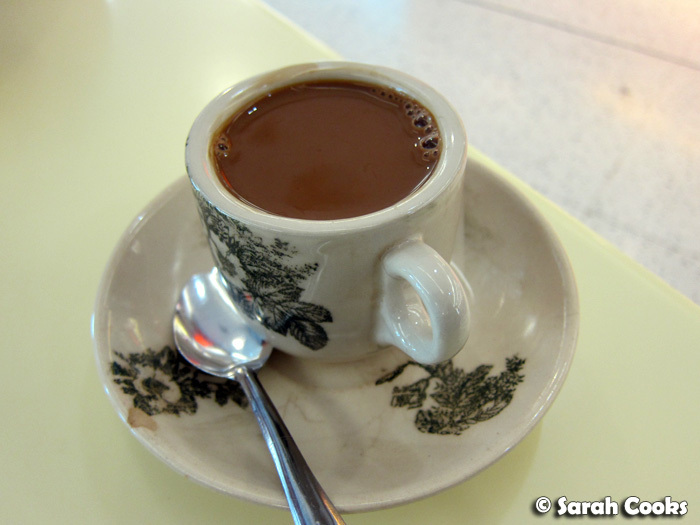 Kopi - really strong coffee with condensed milk, my favourite! 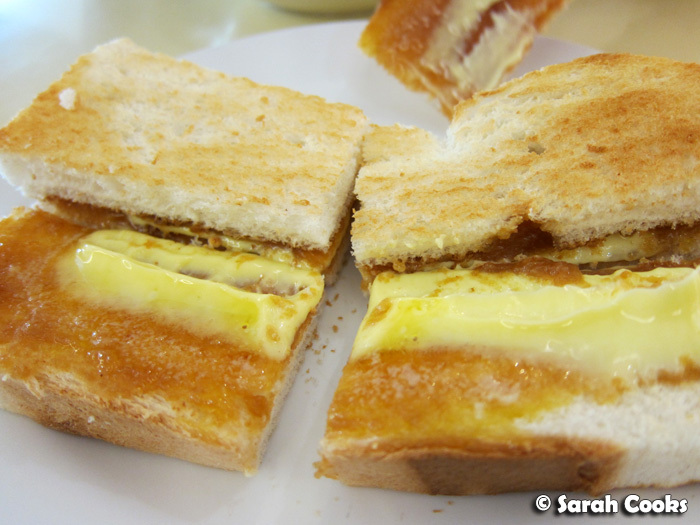 Kaya is, as I'm sure most of you will know, a sweet coconut milk and egg jam - the taste of Malaysia, in my opinion! Check out the butter! Woah! Toast Box is a larger chain (it's actually owned by the same group who own Din Tai Fung and BreadTalk), with outlets all over KL. 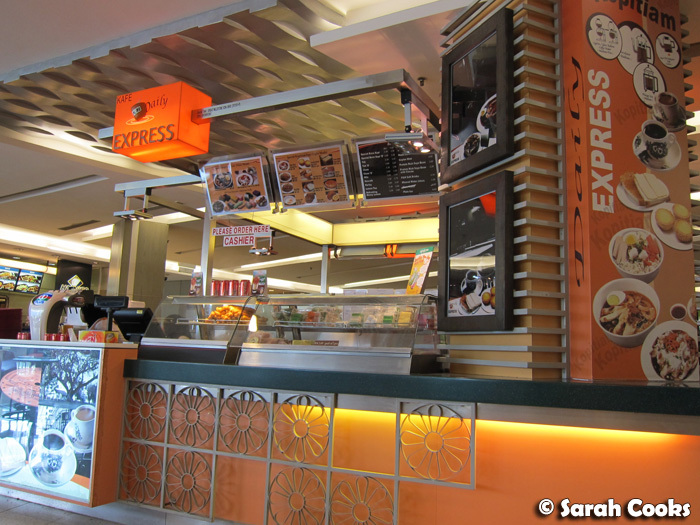 As you can see from the below photos, they provide a more standardised approach than Kafe Express, with perfectly square bread, and combo sets. 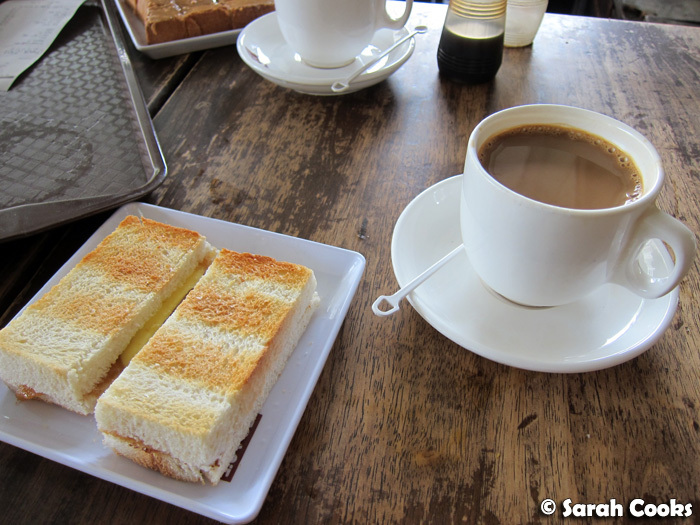 I had the peanut butter toast set, which came with a kopi and two soft boiled eggs (RM7.50). Soft boiled eggs remind me of being a kid, and I really think I only ordered them out of nostalgia! (And the thriftiness of getting a combo set, how Chinese am I?) I prefer hard boiled eggs, but sometimes my mum would make me soft boiled eggs for breakfast. Just like back then, I cracked them into the little bowl, sprinkled them with soy sauce and pepper, and ate them up like a soup. My reward for getting through the eggs was the yummy sweet toast! 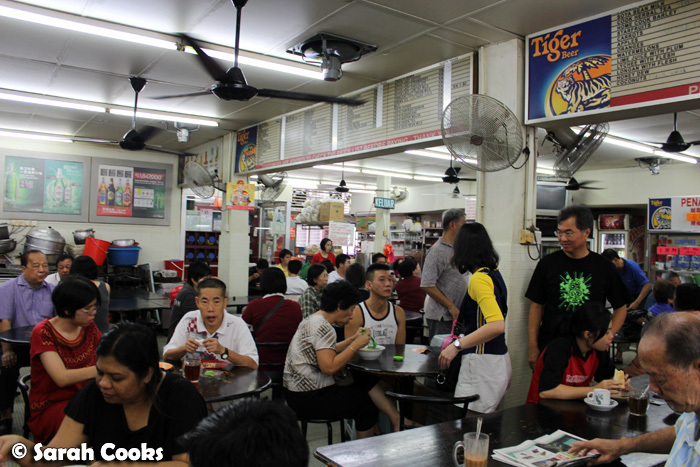 How do you eat your kopitiam breakfasts? Like me, do you eat the eggs first and then the sweet toast? Toast first? Do you order extra pieces of plain toast to dip in the eggs? 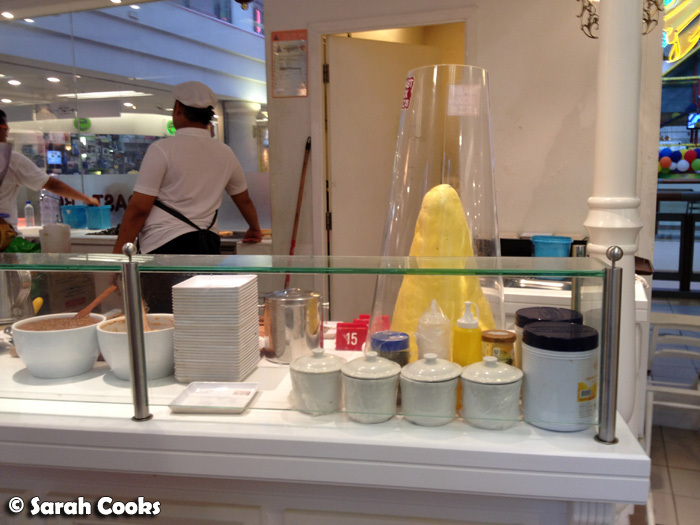 That particular breakfast was at the Mid Valley outlet, but I just wanted to show you a pic from the 1 Utama branch: BUTTER MOUNTAIN! One night, we decided to go for a vegetarian meal, mistakenly thinking it would be a lighter option than all the rich meals we'd been eating. Whoops! Not when you order plates and plates of food, with deep fried mock meat, and oily stir fries! (I do love mock meat!) The below dishes were shared between just three of us. 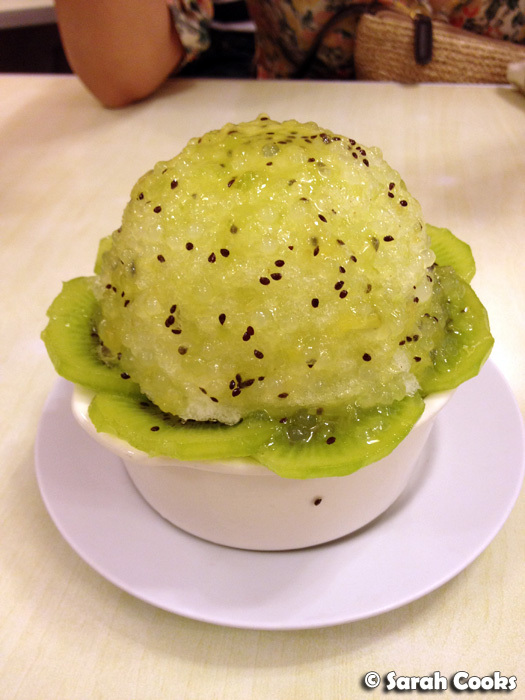 After that fabulous yet oily meal, we went for a little drive to get a refreshing Kiwi Loh - a shaved-ice dessert with sago and kiwi fruit. I don't normally go for Hong Kong-style desserts, but this was truly wonderful! Anyone know where I can get something similar in Melbourne? As I've previously mentioned, we were staying with my friend Su, at her family home, and we were lucky enough to enjoy a couple of dinners cooked by her mum! 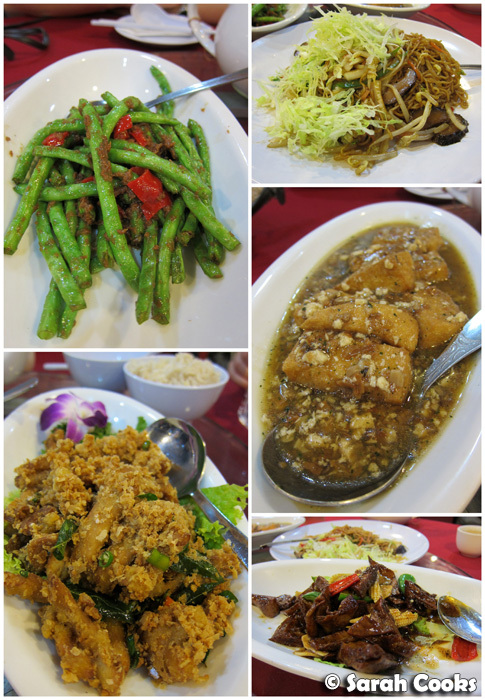 These meals were very different from the Penang Chinese food I'm used to, but all very delicious. 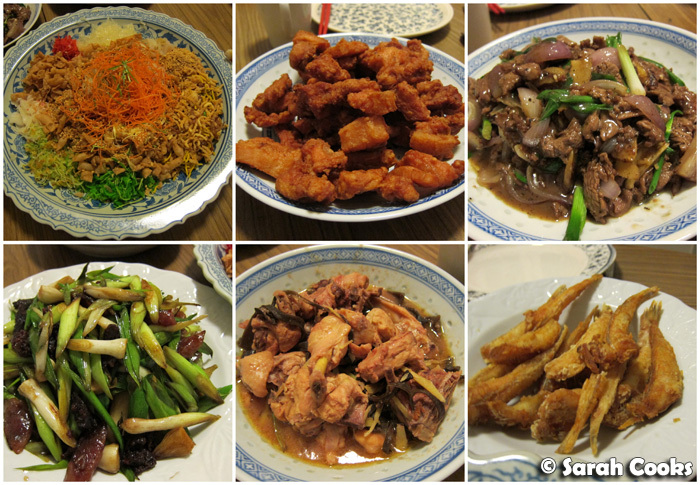 This next meal was for chap goh meh (the end of the Chinese New year period). Chinese hawker breakfast! Awww yeah. 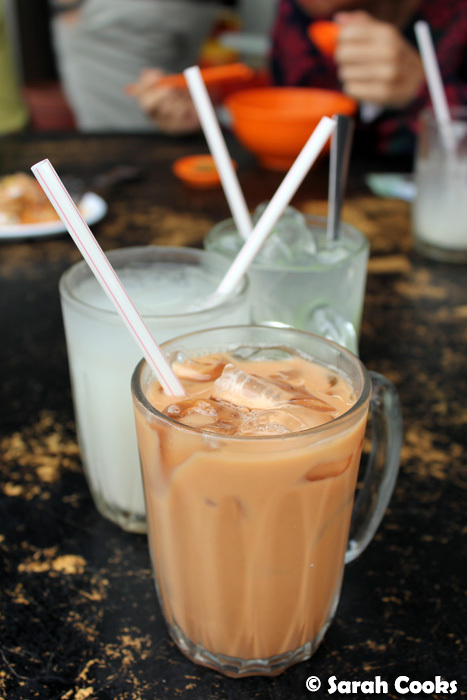 I mentioned in my "Indian" post that you can say "kurang manis" to request less sugar in drinks, but at a Chinese place you wouldn't speak to the staff in Malay - it'd make more sense to speak in the local Chinese dialect (which in KL is Cantonese), or failing that, English. 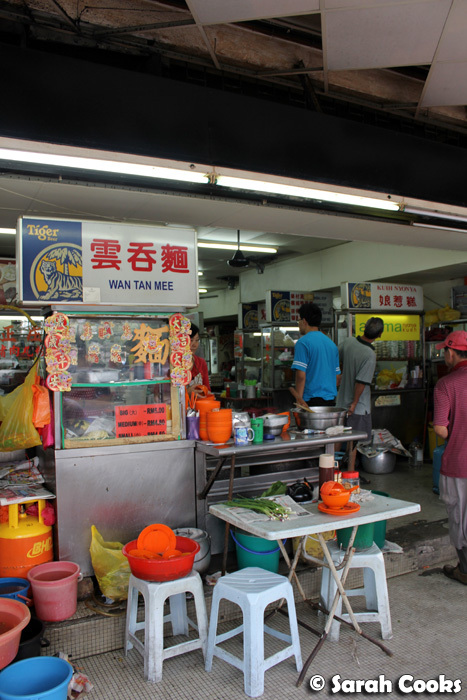 I do understand the Penang Hokkien dialect, and can cobble together a few simple sentences, but can't actually say anything in Cantonese - I totally had to rely on Su to communicate here! So, sorry, I can't give any useful helpful phrases. 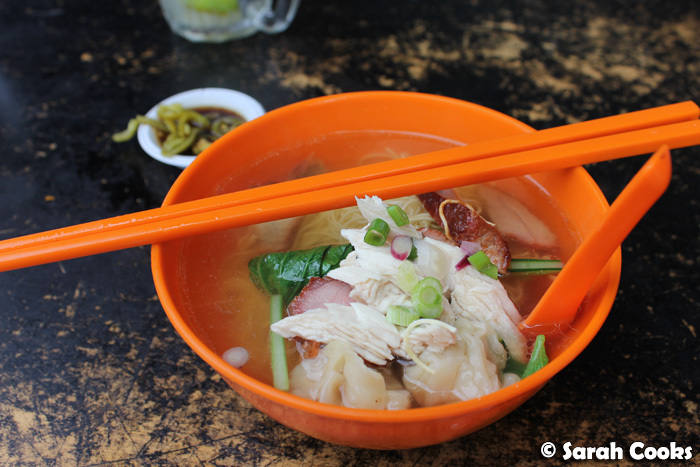 Whilst I am familiar with rice congee and wan tan mee, pork ball noodle soup was brand new to me - and I totally loved it! 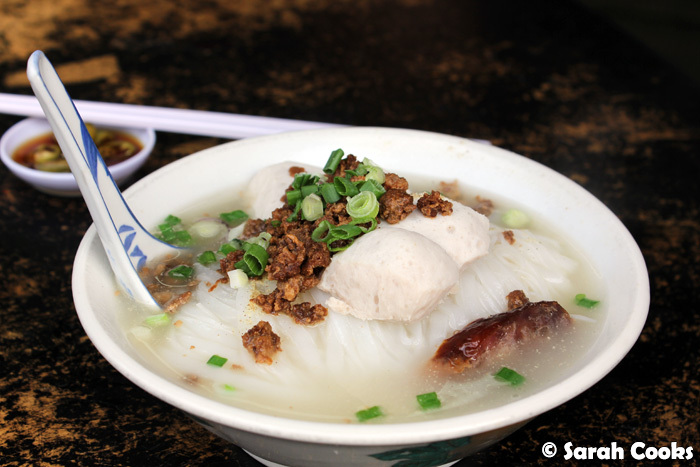 Rice noodles (much like pho noodles), in a porky broth, smooth pork balls, a slice of Chinese sausage and a flavourful soy sauce pork mince. Absolutely fantastic! 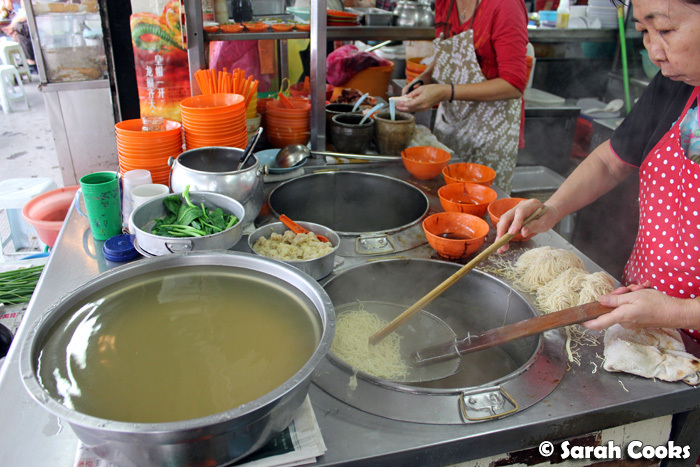 I would definitely travel back to KL just for this soup. 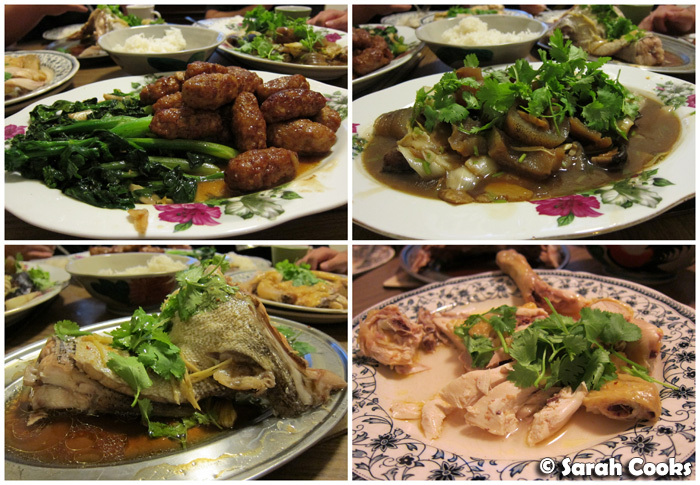 All the dishes were about RM3-4 each. What a bargain! 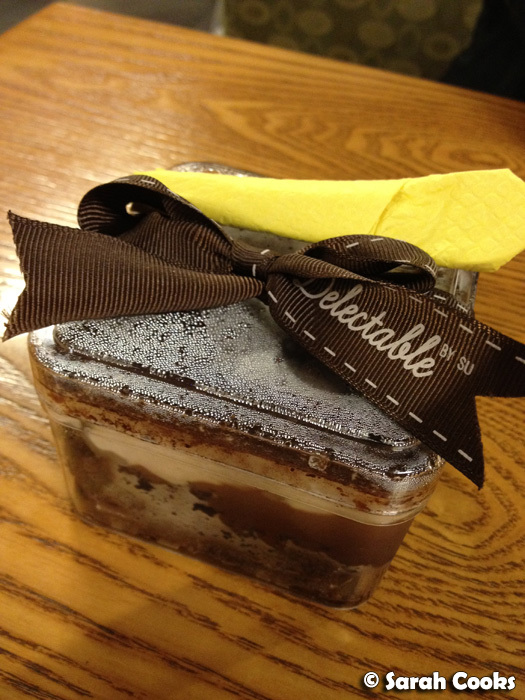 I should just clarify that the Su from Delectable is a different Su from the friend we were staying with! They just happen to have the same name. Delectable Su is a blogger who I've been following for years - a former student who made amazing fondant-decorated cakes as a hobby, and after graduating pursued her sugary dreams and opened a bakery! She wasn't there the day that we visited, but I did buy a "Seven Sins of Chocolate" to try. I must admit I wasn't sure what to expect from the dessert. Whilst I've admired Su's fondant creations for years, I always pictured them as being quite sweet (and y'all know I'm not into really sweet desserts). However, I really enjoyed the Seven Sins! 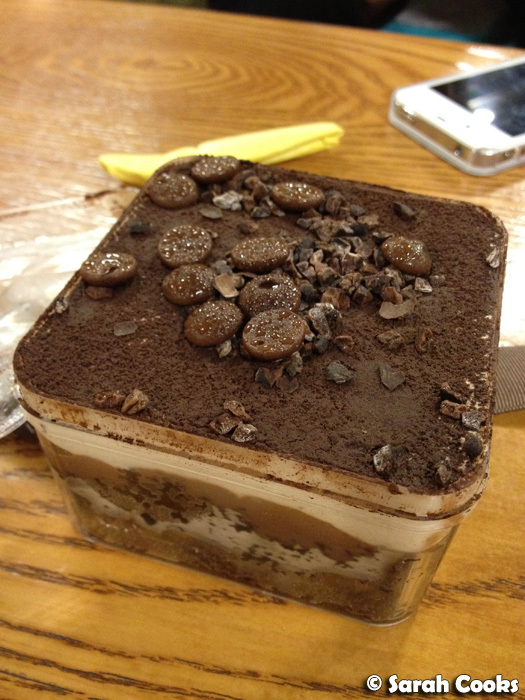 It was kinda like a dark chocolate trifle, with layers of chocolate cake, cream, cocoa, chocolate chips and cocoa nibs. It wasn't overly sweet or dense, but still very chocolatey. 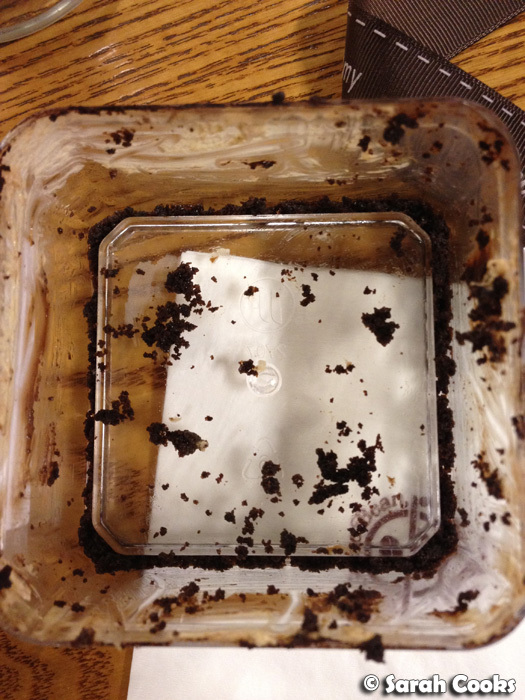 My only complaint was the box itself - some of the cake crumbs got stuck in the corners of the box and it was impossible to get at the yummy crumbs! Now, Sky Bar isn't strictly Chinese, but seeing as Malays and many Indians don't drink alcohol, I felt that the "Chinese" post was the best place for this. 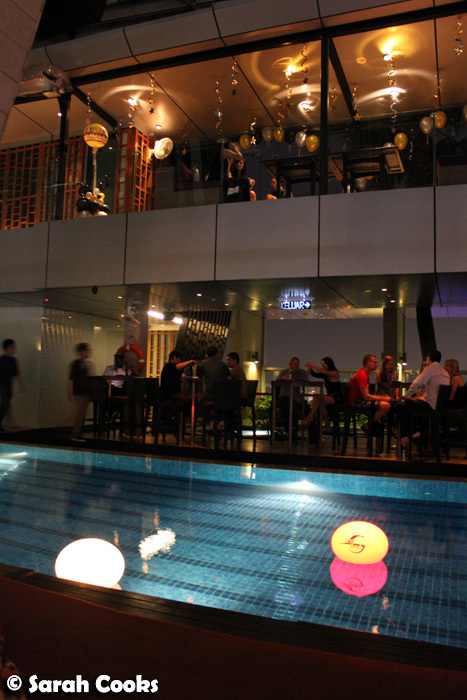 On the top floor of the Traders Hotel, Sky Bar offers stunning views of KL city, including the Petronas Twin Towers. 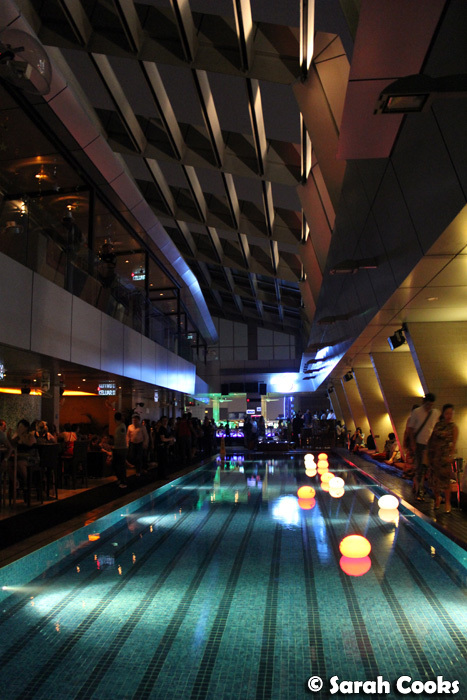 The hotel's swimming pool area transforms into a trendy bar at night. 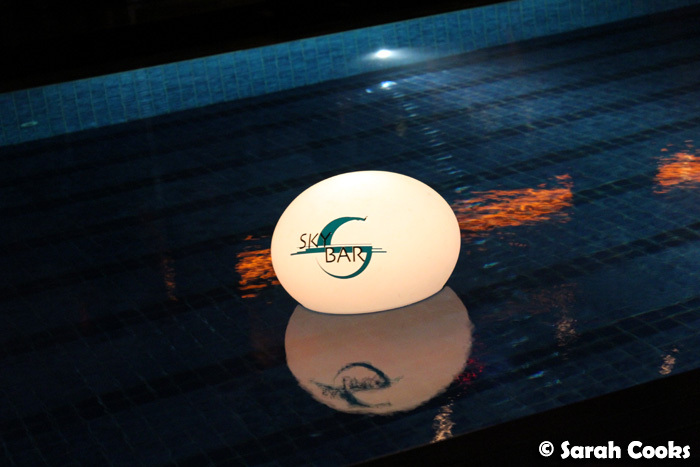 I wonder how many patrons have fallen into the pool after one too many! Insider's tip: the best spots are the loungey cabana seats next to the window (on the right side of the pool in the picture above), which are really popular and need to be booked in advance. A bit of advance planning is worth it though, for the views! I must admit I really didn't like my cocktail. 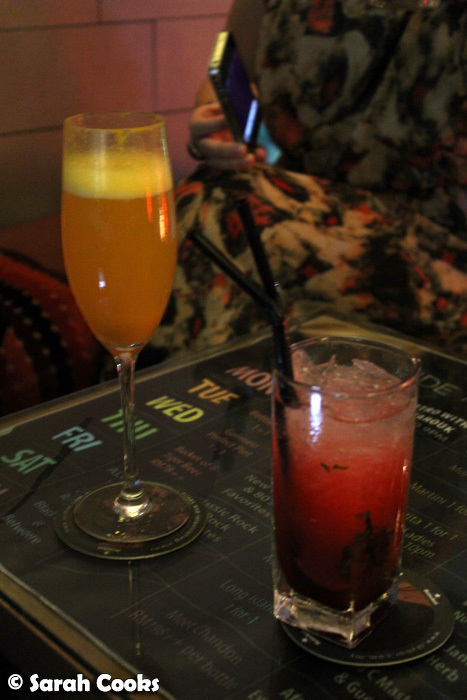 The Be Passionate sounded like something I'd love, with fresh passionfruit, passionfruit liqueur and Moët & Chandon (zomg! ), but somehow the combination just didn't work. The sharp taste of the passionfruit was exacerbated by the dry, almost metallic taste of the Champagne, to make a very sour, mouth-puckeringly unpleasant cocktail. In fact, it would have been better with a less reputable, sweeter fizzy wine. Bit of a disappointment for 67 ringgit! The Raspberry Mojito, on the other hand, was much nicer. Perhaps next time I'll hedge my bets with a cheaper, simpler mixed drink. 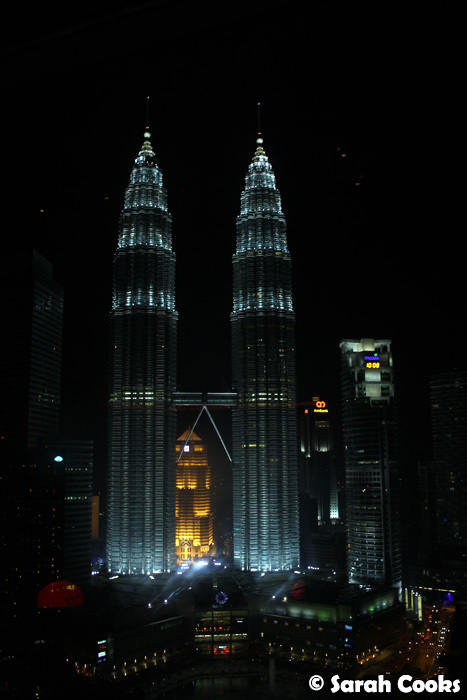 And that, my friends, was Kuala Lumpur! Next up: Penang! 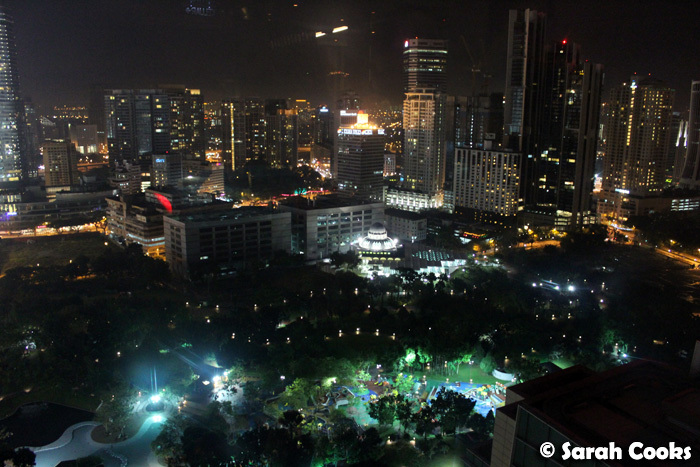 This is the third and final post from my series: 2012 Trip to Kuala Lumpur. Other posts in this series: Indian; and Malay. Epic post again so I think I will have to number my comments so they don't seem too random! 1. Whoa! That dragon is massive! And very cool! 2. I love kaya. And I love soft boiled eggs. But I have never understood the appeal of both of them together. 3. I remember reading Su's blog from a long time ago about her shop! 4. OMG, mock frog legs??!! Nice wrap up and amazing pics. 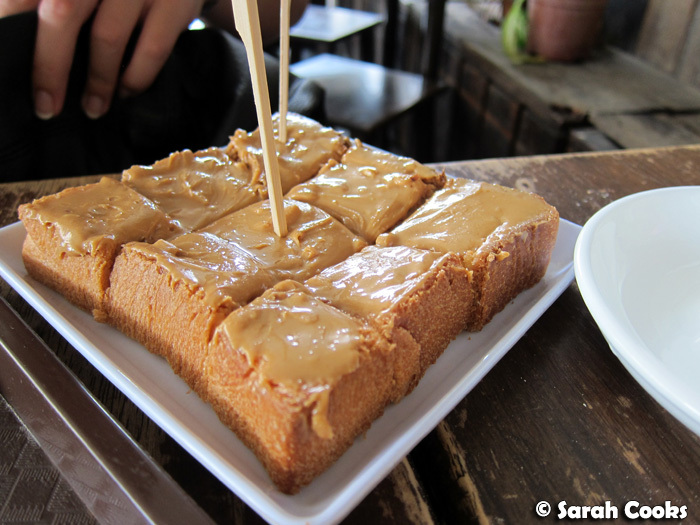 Um, peanut butter toast?! Yum. I actually like frogs legs...when deep fried. 1. I'd never been to Pavillion, so many new malls have popped up since the last time I visited. It's huge! 2. Haha I always eat the eggs first. I've heard stories of people dipping the kaya toast IN the soft boiled eggs (always non-Malaysians) but that just sounds gross to me, lol. 3. She's really made a name for herself since coming back to KL! 4. I have no idea what the frog legs were made of, they were kinda chewy!